Friday October 11th- I awoke for my first day of New York Comic Con after only three hours of sleep, alert and ready for…well.. actually grumpy and wanting to go back to bed. But the clock was ticking and I had to make that (for no good reason) 11 o’clock in the morning Amazing X-Men panel. By the time I arrived in Penn Station, nerds had fully infested the city like a zombie plague, and yes, there were even some zombies. So I did what I always do (and if it’s your first time this is a helpful hint), I followed the nerds to the Javitz Center. It’s a short walk and if the weather is bearable, there’s no reason to pay for a cab or wait for the shuttle. I arrived at the Javitz Center, spent probably around 10 minutes looking for the panel room (since they like to shuffle the landscape around randomly) and was ready to..wait in line for like ...45 minutes. But then it was panel time. Now we come to the announcements for the All-New Marvel Now! Initiative. First off, they talked about Charles Soule and Javier Pulido’s She-Hulk. They’ve already announced it so it’s not huge news, but get this. On top of writing around 6 books for multiple companies, did you know Charles Soule is also a practicing attorney? No? Well now you do, and now you can further appreciate how good Charles Soule is. (Oh and he’s also bringing Ghost Rider into his Thunderbolts title) Ok moving on to Richard Isanove the artist of the Dark Tower series will be doing the next arc of the writer/artist book The Savage Wolverine which will take place in the 30s, and doesn’t sound half bad, but I was wearing a Cyclops Was Right T-shirt today, so you can infer how I feel on spending extra money on Wolverine. After that, Bendis announced …oh wait I mean one of the editors announced that All-New X-Men and Guardians of the Galaxy will be crossing over starting January for “the Trail of Jean Grey”, a new arc where the rest of the galaxy learns of young Jean returning and tries to punish her for the destructive recent acts of the Phoenix. Honestly, this sounds great and lucky for me I’m already reading both of those titles. The final announcement was Peter David’s All-New X-Factor which features Polaris, Gambit, Quicksilver, and three other unnamed characters working as corporate superheroes for a Googleesque company that wants to expand into the people saving business. Now I came in late with David’s X-Factor, but of the little I read, I enjoyed quite a bit and cannot wait to get in on the ground floor of his next endeavor. After this came the Q and A portion of the panel, and I was going to write down each one and tell you any tidbits that fell from this section, but the first question was so pointless that I knew that wouldn’t bear any fruits, so I decided to catch up on my missed Z’s before leaving the panel room. In-between panels I decided to putz around the show floor. The main floor is massive and takes a few hours if not an entire day to really learn. There are still parts of it that I couldn’t find like Artist’s Alley and that fabled DC booth that I’ve been told exists. (it's to the left, Andrew! -Paul) But what’s not hard to find is cosplayers. They range from simple to extravagant, and I don’t have a good camera or good cameraphone for that matter, so you’re just going to have to take my word for it. (Unless someone else from the site caught a picture). But my favorite so far was a Megazord. And of course there are plenty of impressive Harley Quinns, Batmen, and Captain Americas. The weirdest thing though is that I’ve seen a ton of Red Hoods, and only two Jokers. By the time I walked around the floor a few times just absorbing it all it was already panel time…again! At this one we’ve got Jonathan Hickman (Avengers and New Avengers), Al Ewing (Mighty Avengers), Dennis Hopeless (Avengers Arena), Nick Spencer (Secret Avengers), Ales Kot (also Secret Avengers), and the two major editors for the Avengers line Tom Breevort and Lauren Sankovitch. Right away this panel gets more points in my book because the writer of the main Avengers title decided to show up. But that’s where the differences ended because just like the X-men panels, they couldn’t talk about their upcoming arcs because it would spoil Infinity; the current Avengers-centric event. Although Hickman showed up, there were many Avengers writers that did not such as Rick Remender who writes Uncanny Avengers, which last year was labeled the “flagship” Avengers title, but was not even mentioned during their general announcements today. (It didn’t come up until the Q and A portion) In addition to that, none of the solo Avenger titles were represented. Come on guys you’re Marvel. We expect more from you. 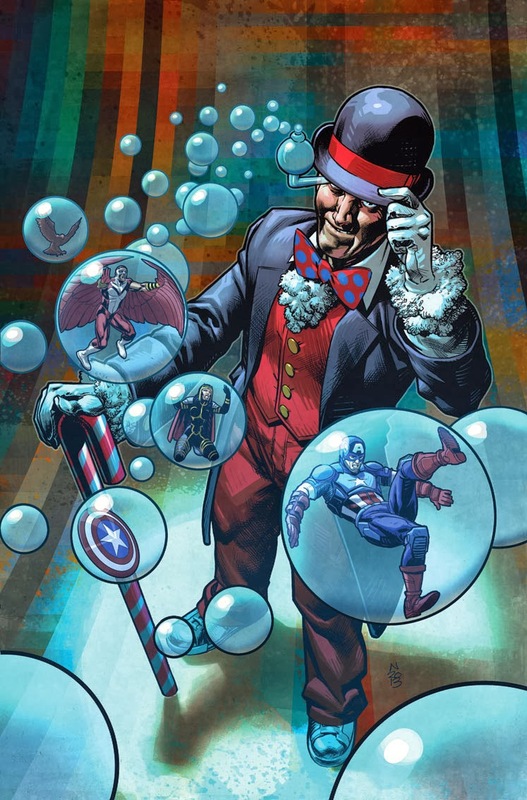 As for announcements, they introduced the newest Captain America villain, Dr. Mindbubble, an eccentric 60s character whose sole purpose in life is to eliminate super soldiers. I know what you’re thinking and I can’t make this stuff up. That is legitimately what they’ve got for new Cap villains these days. I hope it’s better than it sounds. They next announced that the “extinction” teaser was a reference to Sam Humphries’s Avengers A.I.’s next story arc….moving on. Ales Kot (from such PR catastrophes as the DC Suicide Squad debacle) is now playing for the Marvel team and will be taking main duties from Nick Spencer on Secret Avengers after the next arc titles “To Maim a Mockingbird” (make of that what you will.) 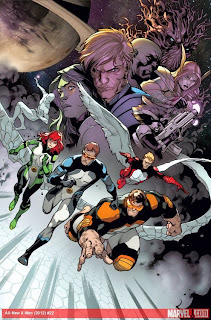 Then Marvel started to roll out the new series starting with Avengers World by Hickman, Spencer, and Stefano Caselli which will examine post-Infinity Earth and how the Avengers (who are in space right now if you’re not keeping up) will handle the hot mess Earth is becoming in the absence. For me this is an instant buy because I’m loving Hickman’s work on Avengers right now. The next was Avengers Undercover buy Hopeless. This is a continuation of the survivors of Avengers Arena as they infiltrate the Masters of Evil, and I’m already committed with these kids so I’ll keep on keepin’ on. Fangirl-favorite Loki is getting his own series from Ewing and the writer promises to trick us in every issue. This actually sounds kinda fun, and I’ll probably give the first issue a try. Especially since Ewing claims he’s going to kill Thor in the first issue, then lie to us. And finally, Marvel is trying to capture lightning in a bottle twice with Nathan Edmundson and Phil Noto’s Black Widow solo series. Why do I say this? Because they said it was going to be a lot like the current Hawkeye series and although I appreciate that now all 6 movie Avengers have a solo series I’m still not sold on this one. Yet again the questions were not helpful except for an Uncanny Avengers question I talked about earlier, but they had nothing prepared for it, so it really didn’t help. And that was pretty much Day One- Wait ... quick bonus panel! Not much to say about this panel except it was a large improvement from the last DC panel I went to where none of the writers came. Instead this one was pretty much all Bat-writers, and Greg Capullo who is hilarious and has some great input, so he’s always welcome. The major thing revealed at this panel by Scott Snyder (main Batman writer if you haven’t heard of him) was that fan favorite Stephanie Brown will be returning into the DC Universe in the recently announced Batman: Eternal; a weekly comic about parts of Gotham not usually covered. It starts in April 2014and I’ll probably be picking up at least issue #1. Other than that they made no mention of the big Detective Comics #27 they hyped up yesterday or the creative change for that same book on the horizon. And that was really the end of my first day at New York Comic-Con. So far it’s been a lot of fun, and I look forward to more laughs, cosplayers, and announcements. ...And maybe even finding the hidden Artist’s Alley (it's all the way to your right, Andrew! -Paul) and the mythical DC booth.